Platinum Baguette Cut Diamond Wedding Ring with Round Brilliant Cut Diamonds. 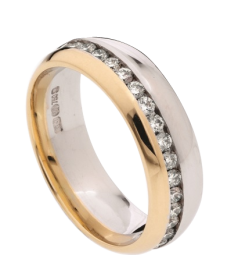 The 2 Diamond Cutting Styles in this wedding ring creates an interesting combination. Round Brilliant Cut Diamonds are combined in this Platinum Baguette Cut Diamond Wedding Ring. The combination of diamond cuts creates 2 different types of sparkle as the light bounces of a baguette cut diamond differently from a round brilliant cut diamond. For this reason the wedding ring suits a variety of engagement ring styles. This Platinum Baguette Cut Diamond Wedding Ring looks stunning beside an Emerald cut Solitaire or a Round Brilliant cut Diamond Solitaire Engagement Ring. This wedding ring also looks really impressive with a 3 stone ring which has been created using an emerald cut diamond and round brilliant cuts. For anyone who wants more than one diamond shape in their wedding ring then this platinum baguette cut diamond ring is a wonderful option. Variety is the spice of life and this wedding ring offers exactly that. 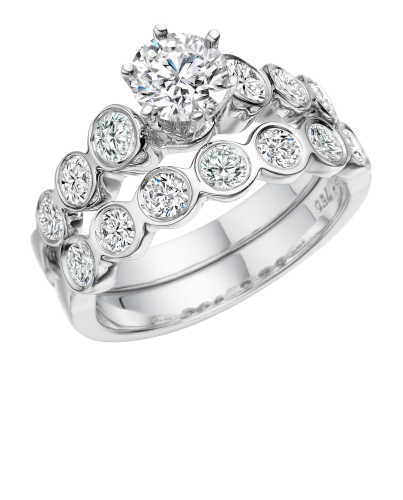 Other wedding rings combining different diamond cuts are available in store. 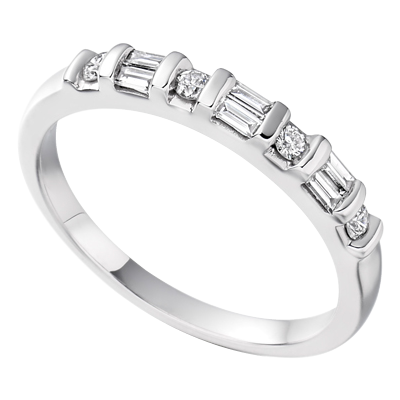 We stock wedding rings with princess cuts and baguettes, round diamond and baguettes, princess cut and baguettes etc. Also any wedding ring can be created to suit the customer’s taste. This platinum baguette cut diamond wedding ring is also available in white gold, yellow gold or rose gold. 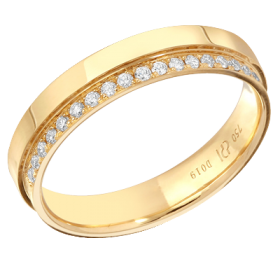 As well as making an impressive wedding ring it can also be worn as an eternity ring.